Because why would someone who is dieting eat a plain cantaloupe, when they can eat it with lime Jello and canned pineapple (sugar) chunks? Because ham isn't slimy enough! Also, is it supposed to be served on a bed of ham fat? Salmon and cottage cheese really is an underrated combination. Also, those boiled eggs are a perfect garnish to balance out all those mushy textures. Cucumber, celery, and lime Jello; one of these things is not like the other. How do you improve upon a yummy piece of lamb? 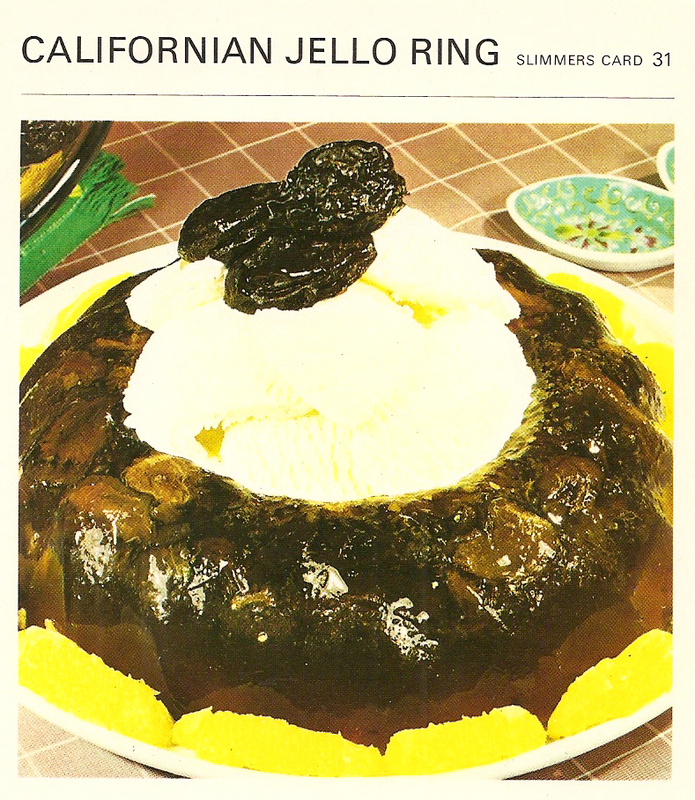 Apparently by over cooking it, setting it in gelatin, and garnishing with capers. CAPERS! If a combination of lime Jello, mayo, and cheese wasn't mouthwatering enough, then the addition of tuna fish should make it down right irresistible. Have you ever eaten a hot dog and said, "wow, sauerkraut should be more than just a condiment!" If so then this is the dish for you; also don't forget to serve with horseradish mayonnaise for that extra tang. D-E-L-I-C-I-O-U-S: Canned tuna fish served with pimento stuffed olives and tomato gelatin. "Oh no, the roast is supposed to be weirdly oozing." Lemon gelatin, pimiento stuffed olives, sweet pickles, walnuts -- this is basically a dish made up left over pantry ingredients that you have no idea what to do with. Is there even turkey in this?! Clearly you are eating salmon wrong if you are not eating it with lemon gelatin. I think this has to be mislabeled, cause there is no way that isn't made of tripe. I'm convinced that someone must have been really high when they thought of this recipe. I'm sure the gelatin really brings out the ox tongue's rubber texture. WTF?! I DON'T EVEN KNOW WHAT I'M LOOKING AT!